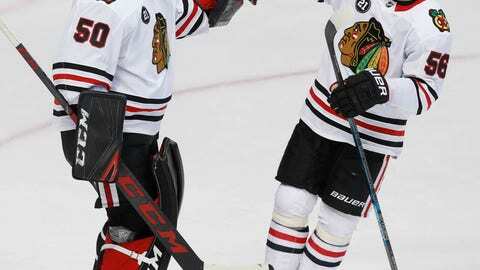 Crawford helped Chicago shut out Dallas for the last 53:37 in the team’s second straight win. Crawford made 26 saves in his third victory in four games since recovering from a concussion. “Right from the first faceoff it was intense,” Crawford said. “All our guys were into the game. Guys were making great plays. Smart plays. Connor Murphy had a game-high seven of Chicago’s 21 blocked shots. Dallas finished with 28 blocks, including five by Roope Hintz. Murphy also started the play that ended with the Blackhawks’ tiebreaking goal in the first. He dived to bat the puck out to Patrick Kane, who skated through the neutral zone and passed to DeBrincat behind the Dallas defense. He had an easy wrist shot from the slot 36 seconds before the period ended. NOTES: The Stars missed a chance to tie a franchise record with a third straight shutout. The first-year expansion Minnesota North Stars’ Cesare Maniago had three in a row Dec. 13-16, 1967. … In 47 career games against Dallas, Kane has 56 points (26 goals, 30 assists). … The visiting team has won all three games to date in the season series. … The only three power plays were for Chicago, which fell to 2 for 23 over six-plus games. The Stars have been successful on their last 14 penalty kills. … The Blackhawks had a 77-60 advantage in total shots.